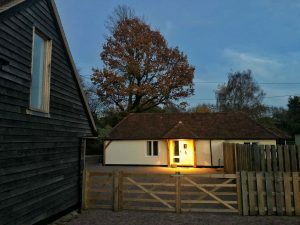 We have two units of self-catering accommodation available onsite: The Stables and The Old Workshop. These are situated on either side of a private paved courtyard, with ample and secure, off-road parking. Bicycles can be stored closeby. 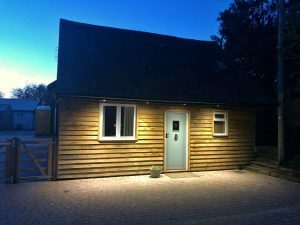 These two units have been converted recently to a very high specification and are ideal for students and partners taking a course at The Windsor Workshop. The workshop is just 50 metres from the front door! The Queen’s Head pub is 5 minutes walk away, along with a Post Office stores and beautiful 11th century church. Supermarkets are 3-4 miles from the farm. The Stables is the larger unit, with an upper mezzanine bedroom with a 5 ft. double bed and also a sofa bed in the sitting area downstairs. The Old Workshop is more compact, also with a 5 ft. double bed and bed-sit layout. Both units have fully equipped kitchens and shower rooms. Some store cupboard basics are provided and fresh milk, bread butter and fruit will be put in on the day of your arrival. We have strict NO SMOKING and NO PETS policies! If you are interested in renting one of the units, during a course, please contact James Mursell to check availability.